The YakAttack BlackPak crate system is poised to set a new standard in rod, tackle, and gear management on kayaks and standup paddleboards. It ships flat and assembles quickly using common hand tools. The interlocking joint design creates incredible strength, promising many years of trouble-free service. The clean, tactical appearance demands attention and the rapidly developing line of YakAttack BlackPak accessories means there's always another problem solving innovation just around the corner. The YakAttack BlackPak has stations for up to 10 rod holders, each of which can be installed vertically or angled. When 4 or more rod holders are used, they can be installed in the "high and dry" position, preventing unwanted seepage from a wet tank well. The top rails are configured to accept all YakAttack GearTrac or Mighty Mount compatible accessories. The lid is hinged and latched with elastic cord, and is designed for easy removal, allowing it to double as a bait board. YakAttack BlackPak has many predrilled holes, which doesn't match the same brand accessories. I had to drill holes to install YakAttack Gear Trac 12 inches on the top of the pack. The same with the Yak- Gear Build-A-Crate 3 Rod Holder installation. The YackAttack logo is no longer engraved on the ACK version which is kind of a bummer. I was meticulous about putting the pak together but still ended up with the panel support screws bulging slightly out of the side panels. You can actually see where this is happening on the left hand side of AKC's stock photo if you magnify it, though theirs is very slight. Just cosmetic but still not something i was hoping for with gear this expensive. Lastly this thing is heavy! it weighs in a tiny bit over 10 lbs empty. ACK, like always, was super fast with shipping and they are always friendly every time I've interacted with them. I'm certainly proud to have their name on any gear I own. Works great on my Eddyline Caribbean 14 Sit-On-Top Kayak and easy to assemble. Way better than a milk crate. Bought to use on Ocean Kayak Big Game II and it fits perfectly even with the rod holders attached (there was a question asked about fitting the BG2 and the stated response was that it would fit but might not be able to attach the rod holders). I found it easy to assemble and the BlackPak seems extremely durable. I have been happy with all of my YakAttack products purchased to date. Very well made, more space then anyone really needs. Wasn't sure about putting this much money into a pimped out milk crate but I love this thing. It has a lot more room than a milk crate. I was able to get a six pack sized cooler along with 2 Plano 3700 series waterproof boxes plus a boonie hat, sunscreen and even my grapnel anchor and float! Does what it's supposed to do. Tough, sturdy. Assembly is a little funky but other than that it's great! Purchased the YakAttack BlackPak for my Jackson Cuda 14. Fits very well, and does an excellent job of storing my tackle securely, great place to secure my fishing rods and allows me to attach other accessories to. Perfect. Well built. Couldnt be happier with this product. Quick and immediate service. Quality product. Fit well in my Hobie Outback. Lots of room for tackle and mounting options are nice also. excellent storage box...easy assembly, very light and provides lots of choices and options..
Used with a Native Slayer Propel. This box works perfectly with the rigging included with the slayer... rollover and get upright both with your box and everything in it. This is a hardy box that is well packed and takes some time to assemble: plan on 30 minutes if you are using an electric screwdriver. That said it's RUGGED. BlackPak, love it. Gives the kayak more room for storage. Allows me to carry 2x the amount of rods on the yak that I usually carry. Another great product from YakAttack. I bought this to simplify my kayak fishing and it works great. I originally set mine up with two rod holders on the back side and one on the front. After snagging my rod, I'm going to move the front one to the back. I grew boat fishing so a lot of my Plano boxes are the 3700 and I would go with the waterproof 3600's on the BlackPak. You can get a 3700 in it, but you have to put it in at an angle. I put plastics in the 3741 boxes that seal and they are narrow enough in the width to get in and out no problem. Product as advertised. Assembly was straight forward. Fits nicely in my "Big Rig". I used the YakAttack BlackPak for my fishing stash on my pontoon float and kayak. It is rugged enough to take a beating but still works like a champ. I believe it will be with me for a long time to come. I search for the right tackle/storage box is over. Simple and very efficient. I would recommend this to my friends. The Black Pak assembles easily and is perfect for my Hobie Revolution 13. Freaking thing is awesome only half of it fits in my yak because I have a eagle talon 12 sot and it goes from wide to narrow. So what I did was get some PVC 1/2 inch pipes and have it sitting on those with some bungee cords to secure it. But overall the black box is awesome have all my plastics, hard lures, bobbers, hooks dude my whole tackle box in it and even have room to store my fish finder. And I even have a extra three rod holder good job yak attack but only thing was hey no stickers... But whatever I'm happy with it had it had some sticker it would have been a five star item for sure. I got the white one. It is perfect in the back of my Ride 135. Just needed to add some sound dampening to the lid where it hits the kayak and between the lid and box. It keeps everything dry. So much easier to open on the water than the PrecisionPack. Heavy duty and nicely made. Mine was missing 4 screws for the bottom feet. Fits perfectly on my JK Cuda 12. The black Pak is quite large. It holds a lot of items and securely protects them from falling out in the event of capsizing. Recently I did a surf launch and on my way back in the waves were considerably higher. I got flipped over in 3' of water and it took me 2 tries to get the boat flipped back over. The Black Pak held strong the whole time. Another convenience is the many holes for different accessories applications. great product! Nice materials; assembly required but very easy to accomplish. Just the thing for a solid storage box on a fishing kayak. I purchased this as a gift, and thought he deserved the best of the best...Professional grade strength, appearance, and he said it was easy to assemble. Definately worth the price overall! Sturdy contruction. Assembles easily. I added hinges to the lid (my own preference). Exactly as described. Very durable material and good build quality. I love my Yak Attack Black Pak... 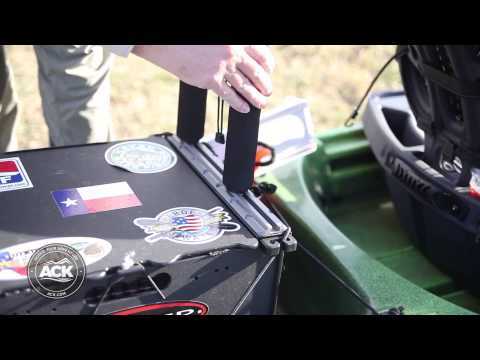 I have an electric trolling motor and It fits my Hobie Pro Angler Perfectly. . Holds up to 2 of my Optima marine batteries. Or when I am not using my trolling motor I can carry plenty of other things inside it safely. Great product. I like it. I went the homemade route first, but the base was too wide to fit in the rear well. My fault for not measuring before starting production. Having gone the homemade route first, by the time I ran down the components and spent the time making something that is similar to the BlackPak with a lid, I had more time and money in to it than the cost of the BlackPak. I should have gone this route first and been done with it. Added bonus of being able to add a GearTrac to the BlackPak too even if you may have to drill some of your own holes. The only reason I didn't give it a 5 star is the price. Otherwise, it's quite a remarkable crate. I actually use it in the winter ice fishing with rod holders on the rails, flasher screen mounted, battery and gear inside. And it's great on the 'yak too. Many riggIng options. Worth the money. I really like my new YakAttack BlackPak. It was easy to assemble, extreemly functional and fits nicely in my Jackson Coosa. The only thing I can think of that would make this product better would be a divider plate to help keep gear better organized. This is an amazing product put out by yak attack. I was in the beta test and now own 2 of these. Its a great buy and easy to assemble. Q: All he pictures show 2 rod holders attached, The description does not mention rod holders. Does it have included rod holders? A: This item has 3 rod holders that are included, as pictured. Q: I may of missed it somewhere, but what's the dry weight of this box? 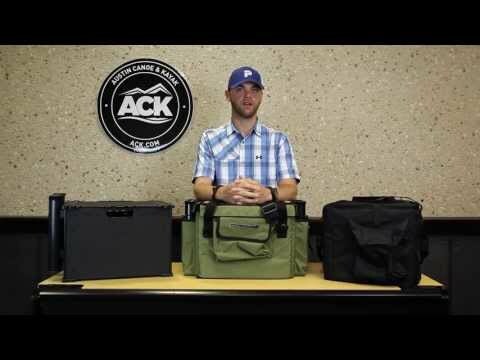 A: The YakAttack BlackPak's dry weight is approximately 11 pounds. Q: Does this come in white? A: Hey there, thanks for the question. We only sell the BlackPak in black. You can, however, buy it from the YakAttack website in tan. Q: Hello will this fit behind the seat in the 3 Waters big fish 120? Thank you. A: The dimensions of the blakpak at 12"x16"x11" so it should fit in the rear storage area of the Big Fish! Q: What length and model GearTrac would you recommend for the top of the pak to hold my Boomstick and visi light kit. Thank you in advance. A: I would recommend something along the lines of a 8-12" Yakattack gear track. Q: I have an old town next. What is the best way to secure the blackpak in the hull? 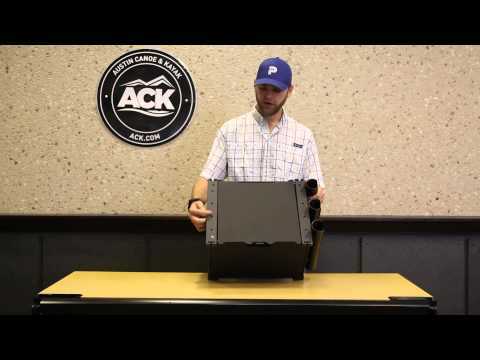 A: Hi, we can not guarantee that the blackpack will fit in the rear tank well. If this a kayak you currently have, you can take measurements of the tank well and email us and we can check to see if they will match up. A: Hi, this is not going to fit in the tank well. Q: Does the Blackpak fit in my Old Town Predator MX? I got a milk crate but it does not fit flush, will this product? Q: Will this fit in the rear tankwell of a pescador pro 100? A: Thanks for your question! This item is universal therefore it should fit just fine! Q: Will this fit the Feel free Lure 11.5 sideways and longways? I'm asking before I purchase one because I plan on utilizing this sideways so the rod holders will be on the left hand side, and the opening will be directly behind me. A: Yes, the blackpak will fit on the rear tankwell. Q: Will this fit a perception pescadore pro 120? A: Yes, length wise this item will fit on the top of the BlackPak. However, you will need to drill some holes to accommodate for the multiple bolts used in mounting. A: Yes, this will fit. The Predator XL's tank well is 18" wide. A: thank you for your question. yes, this should fit into the ocean kayak scrambler xt. Q: I have an Ocean Kayak Trident 13 and was wondering if this would work in it? A: The specs on the BlackPak are 12 x 16 x 11, so if your dimensions are within this will work great for you. Q: Will this fit in a Wilderness Ride 115x? A: The YakAttack will fit the Wilderness Ride 115x. Q: Will this fit inside the rear compartment of the Ocean Kayak Big Game II? A: Yes it will, jut be aware that you might not be able to install the extra rod holders. Q: Hello, Can this be used on any Kayak? I have the Wilderness Systems Pungo 120 angler kayak. I'm afraid the Orbix hatch would cause some stability issues for the BlackPak. Anyone have any luck using this on a Pungo 120? A: Technically yes, but on the issue with a sit inside is that it might be top heavy, you can add a foam pad to the bottom of the pack to make it more stable once is installed on top of the hatch. Q: Which gear tack matches the hole pattern on the top two rails of the Black Pak? A: The GT-90-12 is the correct fit from a footprint standpoint but will still require drilling. None of the tracks align with the pre-drilled holes. Q: If I special order 4 Blackpak black rod holders, what will be the shipping cost and when could I expect to receive them? A: It typically takes 1-2 weeks to ship special order items. We offer free shipping if the total order is over $39.99! Q: Do you sell the rod holders separately? Got the box - I like it, but I need more rod holders. A: Yes we can special order the Blackpak black rod holders. The part # is #BLP-AC-0002 and they go for $7.50 each. You can reach us at 888-828-3828 or email us at customer@ack.com if you wish to order.